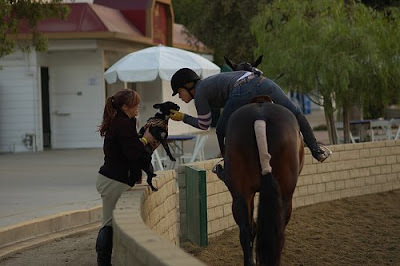 These pics are not of me (I wish) but their a good portrayal of moring at horse shows, and the one with the little dog was just too cute. There is nothing like a good ride on your horse to make the world a better place. I rushed out of work last night, scooped up the dogs and went to the barn to ride my horse. I was actually not looking forward to it as it seemed like just one more thing to do on my list. I gave Possum a good brushing and tacked him up as it is the time of year that daylight is fading and pretty sooon it'll be dark when I get out of work. Anyways so I did a nice long warm-up and others were riding in the ring so I was able to rubber neck and watch all the excitement. Possum was very quiet and responsive. Our warm-up went great and then we started trotting jumps, his and mine's least favorite thing. Usually after a trot jump he will take the momentum and try and canter after, even if I ask him to break down he will insit. Last night he calmly trotted jumps and came back down easily to trot the next jump in the line. He was quiet and steady as could be. I was able to just sit up and work on my position. 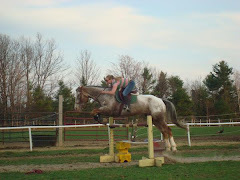 The we started cantering courses and working onour flying changes. He was wonderful. I gave him lots of praise and pats. His canter was a steady 1,2, rhythm making it oh so easy to see spots and make every striding in a line. I couldn't wipe the smile off my face. After only 30 minutes of riding I let him end because everything was literally perfect. I stripped off his saddle and boots and let him loose to eat in the yard as a reward. It really ended the day on a good note. If we have a canter and courses like that at the Medals, we definately have a chance of doing very well. I then watched my roomie ride and they also did very well. She is working on getting her horse more steady and not so hot and excited. Her horse loves to go and jump and slowing it all down and making it look like figure skating instead of ice hockey has been a challenge. 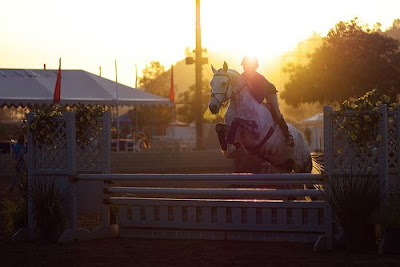 Her horse is an excellent jumper, but lacks some on style and grace, all of the aspects of a good hunter. But last night they were on and it just flowed. I love that feeling. 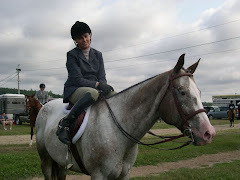 SO we both left the barn in good moods and renewed fait in our riding ability and our horses. I met up with "G" at a little diner place and had chicken fingers for dinner. I went home and took a nice long hot shower and got in bed with the dogs and watched Animal PLanet until 11P. We have visiting hrs at the funeral home today at 4 so I dropped the dogs off at "G's" this morning before going to work. We also have more visiting hrs tomorrow from 12-4 so I have to make sure we're not around for that, which won't be hard since we'll be at the barn getting ready for Sunday. Have a great weekend everyone and be safe. "After only 30 minutes of riding I let him end because everything was literally perfect." I used to LOVE rides like these- so quick and perfect that just makes the world liveable again! Good luck at the show! Take LOTS of pics! I had a good ride today out schooling on a new cross country course. It was awesome. There's nothing like a good ride!! Nice Pics. 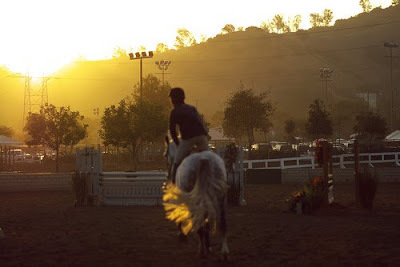 Are these pictures from the LA Equestrian Center?